RAR Expander for Mac extracts the files contained in RAR archives. RAR Expander for Mac supports both single and multi-part archives, and has support for password-protected archives as well. RAR Expander For Mac uses the official unRAR library internally so it is fully compatible with archives produced by WinRAR. RAR Expander for Mac also features AppleScript support & includes a few useful example scripts for expanding multiple archives at once. RAR Expander for Mac extracts the files contained in RAR archives for Mac OS X.
RAR Expander For Mac also features AppleScript support, and includes a few useful example scripts for expanding multiple archives at once. RAR Expander for Mac does not currently support such a feature, as the free rar library it is built on does not support recovery records in RAR archives nor recovery volumes (".rev" files). Adding such a feature to RAR Expander for Mac would require use of the licensed rar library. 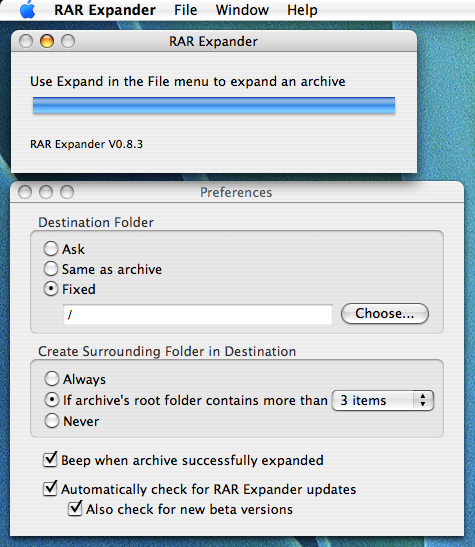 RAR Expander For Mac latest versions are full compatibility with Intel-based Macs. Just download RAR Expander For Mac to have a try now. Decode lost or forgotten passwords for RAR and WinRAR archives. The Librarian: Public catalog search computors without network wiring. Qweas is providing links to RAR Expander For Mac OS X as a courtesy, and makes no representations regarding RAR Expander or any other applications or any information related thereto. Any questions, complaints or claims regarding this application RAR Expander For Mac OS X must be directed to the appropriate software vendor. You may click the publisher link of RAR Expander on the top of this page to get more details about the vendor.